This little book by Henri Nouwen was the second of my Lenten readings, and after the intellectual struggle involved in reading Kierkegaard, Nouwen was like a refreshing drink of water on a hot day. Henri Nouwen was a Roman Catholic priest whose writings have been embraced by Christians across the religious spectrum. A priest and an academic, he was known for his practical spirituality and deep compassion for people from all walks of life. I haven’t read Nouwen for years, but when our rector mentioned him in a sermon recently, I remembered how much I like his writing and decided to seek out one of his books. Imagine my delight in finding this on Netgalley just a few days later. A Spirituality of Living is the third in a series developed by the Henri Nouwen Society and Upper Room Ministries and edited by John S. Mogabgab. 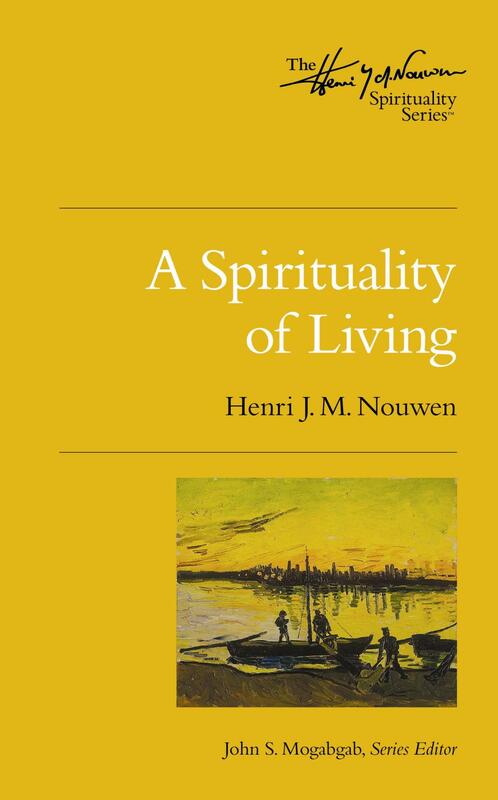 From what I can tell, the book cobbles together several of Nouwen’s writings to create a surprisingly coherent teaching on how to live a spiritual life. Reading it was a little like reading a series of short sermons, or perhaps the transcript of a series of retreat talks. It held together very well. Drawing on Luke 6:12–19, Nouwen explains that the spiritual life comprises three steps: solitude, community, and ministry. Each step builds on the one before it. Jesus began with solitary prayer on the mountain, then called together his community of disciples, and then began to minister to the people. Real freedom to live in this world comes from hearing clearly the truth about who we are, which is that we are the beloved. That’s what prayer is about. And that’s why it is so crucial and not just a nice thing to do once in a while. It is the essential attitude that creates in us the freedom to love other people not because they are going to love us back but because we are so loved and out of the abundance of that love we want to give. This is where ministry starts, because our freedom is anchored in claiming our belovedness. Being the beloved allows us to go into this world and touch people, heal them, speak with them, and make them aware that they too are beloved, chosen, and blessed. When we discover our belovedness, we begin to see the belovedness of other people and call that forth. It is an incredible mystery of God’s love that the more we know how deeply we are loved, the more we will see how deeply our sisters and our brothers in the human family are loved. Nouwen’s writing is my favorite kind of spiritual writing, the kind that’s easy to understand but a challenge to live by. It’s hard to put aside all the noise and pressure of daily life and rest in being beloved. There’s always something else to do and think about. Nouwen says that “our inner life is like a banana tree filled with monkeys jumping up and down.” Isn’t that a great image? But in a sort of parable that closes the book, Nouwen shows a way forward. He writes of a river that manages to make its way over a rock and through a wall and a forest but then comes upon a desert that it cannot traverse without drying up. A voice from above tells the river to “just surrender. Let me lift you up. Let me take over.” The sun then turns the river into a cloud that drifts over the desert and rains on the faraway fields, making them fruitful. What does letting go look like in my life? That’s the mystery that Nouwen leaves me to chew on. This entry was posted in Nonfiction, Religion and tagged E-Galley, Review Copy. Bookmark the permalink. I haven’t read Nouwen in many years and your post reminds me that I have one of his books on my TBR. I must get to it. I’m sorry I let so many years pass without reading more of his books. I think I’ll be adding him to my church book group’s list of reading possibilities. Thank you for writing such a beautiful review of Henri’s “A Spirituality of Living”. We would like to post your review on our website, with a link to your blog. Would you give us permission to do that? You have my permission. I was very happy to come across this, as it was a perfect addition to my Lenten reading. Thank you very much Teresa! Happy Easter!